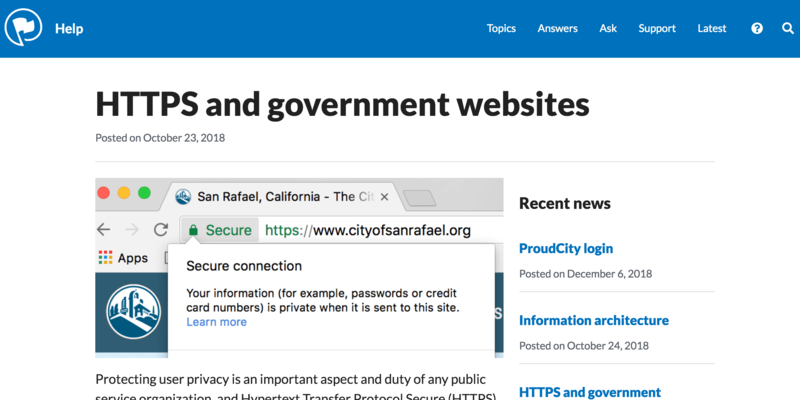 There are several key components of a government website post or page that should be addressed when publishing either. The title of the post/page is the heading (h1) of your web page. This is the blog post/page title. ProudCity automatically formats the title into the page headline. You do not need to replicate or copy the title into the body of your page or post. The body is the main content area of the post/page. NOTE: The ProudCity Pagebuilder is only an option for Pages. Categories allow for post classification, which can then be filtered using the ProudCity news posts widget. Categories are like file folders, and similar posts should be “filed” into the correct category so finding older posts is easy and intuitive. NOTE: Categories is not an option for Pages. The featured image is displayed at the top of a post/page, and also in social media posts. To remove the featured image from the top of the post/page, select the “Don’t display image on individual page.” checkbox in the Featured Image widget on the editor and save the post/page. The meta description is a description of the post/page contents. The meta description is important for search engine results and social media posts. Keywords are key topics of the post/page that help search engines identify the primary content theme. The slug is the ending of the URL of the post or page (ex: www.help.proudcity.com/SLUG). This will default to the post/page title, but can be modified using the slug editor. To enter and update these post/page components, login to the ProudCity CMS and add/update a post/page. Here are the administrative locations of each component.